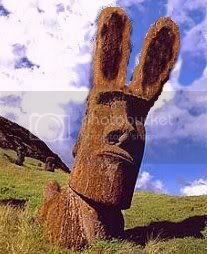 How many Easter Island statues are children? From this pic, I would say 10 children ( no birth control obviously) and I haven't a clue what is on that one statue's head. Good answer, but those are all adults, some are smaller. There are 2 statues of young children. This one near the shore on the south side of the island, Ahu Akahanga if I recall? Many believe that the red things on the statues heads were hats, but they are in fact hair bundled up just like modern day hipsters. Note that the eyes in the last picture were painted on and are not authentic. There is only one remaining eye and it is in museum in the village. Almost like hipster hairdos, but not quite. Soooo.... Any closer to solving this riddle? (08-03-2016, 05:03 PM)Octo Wrote: Soooo.... Any closer to solving this riddle? I did already in a previous post (with pics), 2 statues of children and the red things on top of statue heads are hair bundles.